Ralph’s first two years of service were in Trinidad. The Caribbean was a dangerous place as German U-Boats prowled the islands, looking for tankers leaving the refineries with fuel for the Allied war machine. Like many of the boys, Ralph gathered strength from his sweetheart back home. 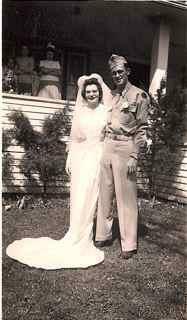 While on furlough after his service in Trinidad, Ralph married Esther Swayze. Ralph sent many letters and loving greeting cards to Esther, which she kept in several large scrapbooks. Following Ralph’s service in Europe, he and Esther enjoyed the freedom he had helped to preserve.